If you try any recipe from this blog, TRY THIS ONE!!!! I was drinking 20+ grams of carbs a day in 4 tablespoons of store bought coffee creamer until I started making my own. This recipe is adaptable for many different flavors and as I try different flavor options, I will post the recipes here. I’m not even going to go into the ingredients in store bought creamer, but if you’ve ever read them, I bet you can’t pronounce some of them. Plus they are loaded with sugar and made with milk. That equals CARBS! 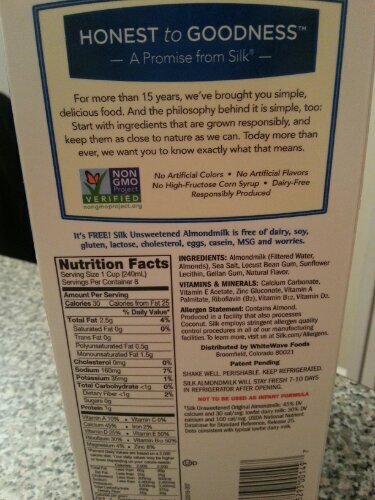 Here’s the back of the creamer that was in my fridge. 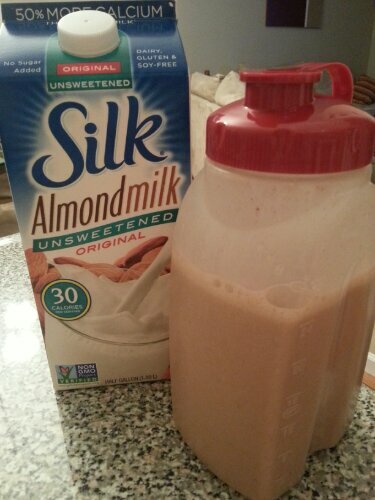 My recipe uses unsweetened almond milk which has less than 1 gram of carbs per cup and vanilla almond milk which has 16 grams of carbs per cup! Plus it’s free of dairy, soy, gluten, lactose, cholesterol, eggs, casein & MSG. No artificial flavors, colors or high fructose corn syrup. I do add 1/2 cup of sweetened condensed milk to thicken the creamer and add sweetness, but this could be optional if you are trying to avoid dairy. Instead of the sweetened condensed milk, you could add more honey for sweetness, but your creamer will be a thinner consistency. My first batch is Cinnamon Vanilla. Pour almond milk into a saucepan and heat to a low simmer. Whisk in the honey and condensed milk. Turn off the heat and whisk in the cinnamon and vanilla. Remove the pan from the stove to cool. Once cooled pour into a reusable airtight container. This should last 7-10 days refrigerated. Tips: I like my creamer sweet, if you don’t like it very sweet then start with 2-3 tbls of honey and taste it along the way. Possibly omit the honey and use the vanilla and cinnamon as the only flavoring. Omit the condensed milk if you are wanting dairy free, but remember that is a contributing factor to the sweetness and thickness. I urge you to experiment with different flavors and experiment with the ingredients you use and how much you use. The whole batch of 4.5 cups = 193 grams of carbs. There are 72 tablespoons in 4.5 cups, that means that 193/72 = 2.68 grams of carbs per tablespoon of creamer! If those numbers don’t convince you to try this recipe, I don’t know what will! It’s even more satisfying knowing that I know what ingredients are in my coffee creamer and it’s SUPER EASY TO MAKE! Oh, and did I mention this is low fat and low calorie too?! This creamer is sweet enough where I don’t need to add any sugar or sweetener! 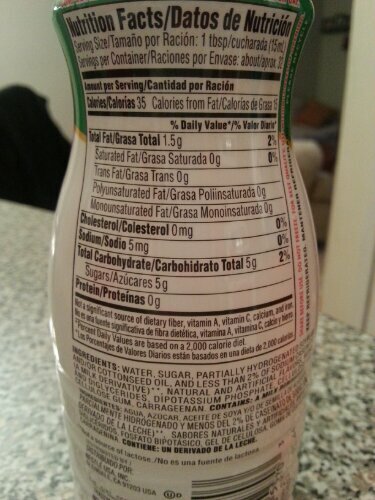 I use about 4 tbls of this creamer which is 10.72 grams of carbs! Compared to my previous method with store bought creamer which was 5 grams of carbs per tablespoon for a total of 20 grams of carbs. I’ve cut my carb intake from creamer IN HALF! I also know exactly what ingredients are in my creamer, too! Check back often for new flavor combinations!